This heavy-duty turntable was designed specifically to cater to the high demands of professional DJs and modern nightclubs. With its powerful direct drive motor and rugged construction, the sturdy Reloop RP-7000 MK2 was built to take on harsh everyday life with ease. By using a combination of metal, rubber and synthetic materials, the RP-7000 MK2's housing is more reinforced and heavy than ever before. This results in a turntable that is extremely resistant to vibrations that can be caused by heavy bass sounds in DJ booths. The RP-7000 MK2's shock-absorbing feet help to further improve isolation. The turntable's surface is coated with a scratch-resistant, high-quality deep black or classic silver metallic finish. The RP-7000 MK2 professional DJ turntable is equipped with a few functions that will make any DJ's life much easier. The newly developed aluminum LED target light is freely moveable to help you find the stylus position in dark surroundings. The target light is also removable and easily exchanged. An additional start/stop button has also been integrated to facilitate a vertical setup (battle position) and by using the buttons on the RP-7000 MK2's top panel, you can switch between the three motor speeds (33 1/3, 45 and 78 rpm). Dedicated buttons for forward and reverse mode allow for further creativity in your mix. Using the high-resolution pitch fader, you can adjust the platter speed in the classic turntable pitch range +/-8%. However, the RP-7000 MK2 is also capable of a wider, DJ-friendly +/- 16% pitch range and a massive +/-50% pitch range. This allows for increased creativity when modulating the playing record's tone. If quartz lock is active, the platter speed will remain unaffected by the pitch slider position. The fine-tuned, quartz-driven motor with digital pitch correction operates at a starting torque of 2.8kg/cm, which can be adjusted up to a maximum of 4.5kg/cm. This makes it an extremely smooth running turntable with wow and flutter of just 0.01% WRMS. 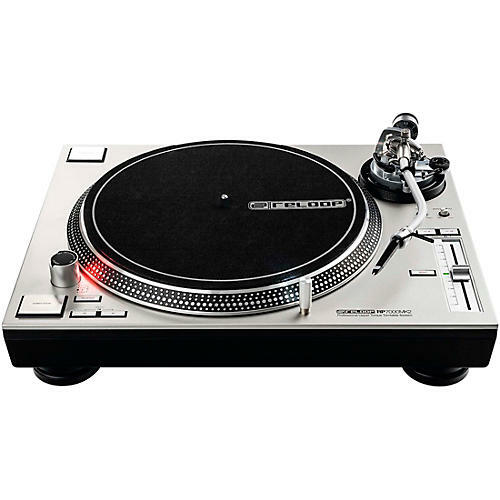 Furthermore, the turntable break speed (platter stop) can be adjusted from 0.2 – 6 seconds and the precision-machined, heavy die-cast aluminum platter is lined with vibration-reducing rubber to eliminate unwanted vibrations and resonance. RP-7000 MK2 features a statically balanced S-shaped tone arm with hydraulic lift and anti-skating mechanism. The newly developed tone arm base provides improved stability and adjustable height/vertical tracking angle (VTA). The low-resonance tone arm comes with a universal connection for pick-up cartridge systems (SME).